Typhoon aircraft from RAF Coningsby have been monitoring the Russian aircraft carrier, Admiral Kuznetsov, as it sails through UK waters on its way home to Russia from the Eastern Mediterranean. The RAF aircraft have been part of a wider ongoing operation that is being conducted in conjunction with the Royal Navy and our NATO allies to monitor the Russian carrier and its accompanying vessels as it passes through the waters of Western Europe on its way home. 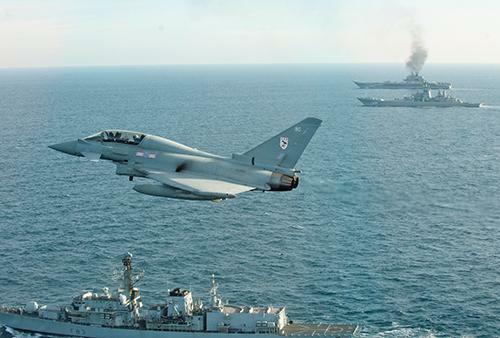 Wing Commander Stu Smiley, Officer Commanding Operations Wing RAF Coningsby said “Whilst the British public are familiar with our role escorting Russian long-range aviation, on this occasion we launched to monitor the Russian warships as they transit near to our sovereign waters”. The Kuznetsov was sent to the Eastern Mediterranean to participate in Russian military operations in Syria but suspended flying operations after two aircraft were lost in accidents. The aircraft carrier has now been ordered home following the end of operations against rebels in the Syrian city of Aleppo.